A tree was cut down on 25th between 7th and 8th during renovations at the Fashion High School. Block residents requested a new tree and have eagerly awaited it's arrival. 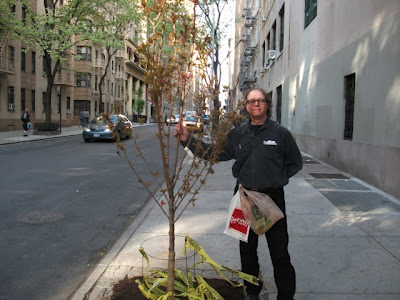 On April 13, 2012 the tree arrived. Seen here welcoming the tree is Ranger Mattlin of the 7th Regiment of Park Chelsea Rangers.